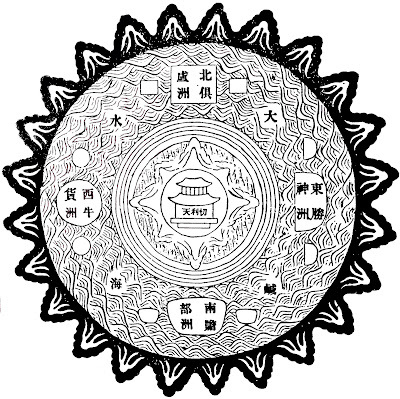 Flower Ornament Depository 華嚴藏: Do Buddhists Believe in a Flat Earth? When I was traveling around India and Nepal a few years ago, I was told by some monks that plenty of people in the Himalayas believe that the world is flat and moreover that many monastic lectures still teach traditional Buddhist cosmology, especially as it is explained in texts such as the Abhidharmakośa-bhāṣya by Vasubandhu (chapter 3 deals with cosmology or lokanirdeśaḥ, part of which discusses the physical world). However, some monks also get sent to study modern science and then express upset over the fact that they spent so much time learning Buddhist cosmology, only to learn that the rest of the world mostly accepts a heliocentric spherical-earth model of cosmology. When I say “mostly accepts”, I mean that there is a movement with quite a large following online that argues that our physical world is comprised of a stationary flat-earth, atop which the Sun and Moon orbit. The proponents of this movement often assert that images of the Earth taken from space by NASA and other agencies are fabrications, and that spherical-earth cosmology amounts to one giant fraud. This movement is still perhaps fringe, but it is growing in significance. A few weeks ago, there was a Flat Earth International Conference in North Carolina (http://fe2017.com/). The Guardian and other sources are reporting that a man in California is planning to launch himself into the air using a homemade rocket and reach 1,800ft (550 metres), where he will be able to make observations. The Guardian (see here) also quotes a “flat-earth convert” who states, “It’s almost like the beginning of a new religion.” This particular comment interests me as a researcher of religions. Scanning online forums on the topic of a flat-earth, I've observed that the inspiration behind belief in this is often stated to be religious – predominately Christian – in orientation. At present, I am unaware of any modern Buddhist teacher of note insisting on flat-earth cosmology, but it still might surprise some Buddhists to know that their religion's cosmology has much in common with modern proponents of flat-earth cosmology. In a Buddhist model, Mount Meru would stand at the center of the Earth, and its height would surpass the altitudes of the Sun, Moon, planets and stars. If you stood atop the mountain, you would be able to look down at all the luminous bodies circling the disc-shaped earth below. What I would like to consider is what the flat-earth cosmology means in relation to modern Buddhism. 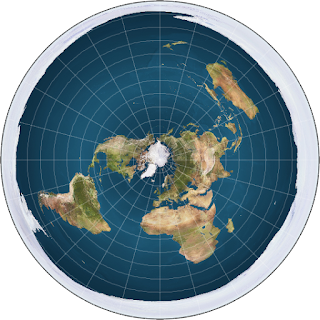 Azimuthal equidistant projection of the entire spherical Earth. After exploring the Buddhist experience of astrology over the ages, it occurred to me that modern Buddhists have quietly overlooked the original features of their own cosmology. This isn't necessarily surprising, given that from the twentieth-century onward, much attention has been placed on areas such as the nature of mind, meditation and Buddhist philosophy. Nevertheless, Buddhist cosmology is a big part of the religion and always has been. Mount Meru and the four continents are frequently mentioned in scriptures. According to Buddhism, you could, in theory, travel to Mount Meru or the other continents if you possessed sufficient spiritual powers (we live on Jambudvīpa, the southern continent). Modern proponents of Buddhism often insist that Buddhism is scientific and always has been. I recently read an article by Natalie Quli titled “Multiple Buddhist Modernisms: Jhāna in Convert Theravāda.”1 Quli outlines the general approach to meditation on the part of traditionally non-Buddhist peoples in modern times. Some of the features of Buddhist modernism that she describes include “the extolling of reason and rationality”, “a belief in the compatibility of Buddhism and modern science” and “a desire to return to the 'original' teachings of the Buddha, particularly as ascribed to the Pāli canon”. When dealing with the science of mind, it is perhaps easy and plausible to open a discussion between modern scientists and proponents of a Buddhist school, and suggest that the Buddhists have always embraced a scientific approach to reality. This empowers Buddhism with a kind of elevated social status that other religious traditions seldom enjoy, but these discussions also ignore long-standing Buddhist theories about the physical world. Historically speaking the Buddhists of ancient India seem to have generally ignored or rejected their contemporary Indian astronomers – all of whom wrote in the lingua franca of Sanskrit – who provided mathematical proofs that the world is spherical. This is an indication that Buddhist thinkers preferred scriptural authority over scientific investigations. What are the implications of all this? If we point out that the Buddha taught a flat-earth cosmology, and his word within a Buddhist context is supposed to be infallible, then we have demonstrable proof that he got something – and something very significant – completely wrong. If he was wrong about the physical shape of the world, is it possible he was also wrong about karma and/or the nature and causes of suffering? If a Buddhist proponent accepts the fallibility of scripture, then they surrender the right to exercise śabda-pramāṇa, i.e., the means to knowing something through the testimony of a valid authority, such as one whose account is recorded in scripture. That means they cannot defer to the testimony of the Buddha in the context of a debate. It also hampers attempts to scout for apparent scientific facts in Buddhist scripture. The fact that Buddhists have historically insisted upon a flat-earth cosmology as physically descriptive and real stands to challenge modern assumptions that Buddhism is, or ought to be, considered compatible with science. I would wonder, too, if the modern Buddhist tendency to associate itself with science is what prevents even the most traditionalist of Buddhists from aligning themselves with the contemporary flat-earth movement. If that is true, then modern Buddhist cosmology is entirely shaped, guided and defined by materialist science. It goes without saying that other Buddhist beliefs are likely to end up entirely reevaluated in the same manner. 1 Pacific World Journal 10, no. 1 (2008): 225-249. Buddha Shakyamuni didn't get anything wrong. Never has and never will. So the question is only then, what has modern science gotten wrong and is the spherical idea of Earth just another giant hoax like everything else we've been taught to believe!! Thank you for the article. "If a Buddhist proponent accepts the fallibility of scripture, then they surrender the right to exercise śabda-pramāṇa, i.e., the means to knowing something through the testimony of a valid authority, such as one whose account is recorded in scripture"
I'm not sure how high the stakes are here given the various hermeneutic strategies Buddhists have utilized. The fact that internal contradictory accounts appear in Buddhist literature, this would seem to pose the same problem, but in some casesthe neyartha/nītārtha distinction has been utilized to explain away these contradictions, and at least in the Indo-Tibetan lineages, some content of the teachings are explained as being given to accord with conventional understandings.